Description: Cap 9 to 18 (35) cm; incurved to plane; viscid when moist, smooth with shallow depressions, wrinkles, or pits; white, turning pinkish-tan, then olive-brown to dark-brown. Pores white, then cream-yellow, eventually yellowish-olive to yellowish-brown, not discoloring when bruised; depressed adjacent to stem. Stem 5 to 10 cm long, 2 to 6 (10) cm thick, the base sometimes enlarged; solid, white; cream to pale brown, upper half conspicuously netted. Flesh thick, firm, white. Smell and taste mild. Spore print olive-brown. Habitat: Small groups or clusters under mountain conifers in late spring. Primary Keys: Spring bolete, off-white to brown cap, white to light brown pores, pores not staining blue. Edibility: Choice: an excellent edible and a great drying mushroom. Notes: This Porcini relative was accorded its own species in 2008. Unfortunately it’s frequently infested with fly larvae. Cut the base of the stem to look for worm holes. The young buttons are frequently only visible as slight mounds with cracking, aka mushrumps. These are also the least infected. 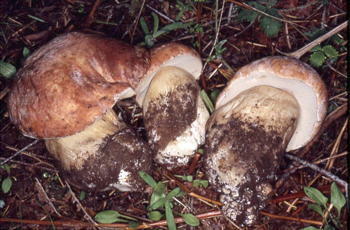 Older specimens are better for drying after judicious trimming, or even for making Porcini powder. Whisk together 4 T. oil, vinegar, parsley, mustard, garlic, salt and pepper. Slice spring king buttons 1/4″ thick vertically. Sprinkle lightly with salt & pepper. Saute in remaining oil over medium-high heat for 3-4 minutes per side or until lightly browned, leaving plenty of room. Add the arugula to a large salad bowl. Add the vinaigrette and toss to coat. Top with peas, spring king slices, Parmesan and pine nuts.